BERKELEY – The dollar is the world’s go-to currency. But for how much longer? Will the dollar’s status as the only true global currency be irreparably damaged by the battle in the US Congress over raising the federal government’s debt ceiling? Is the dollar’s “exorbitant privilege” as the world’s main reserve currency truly at risk? To be sure, the purveyors of dollar doom and gloom have cried wolf before. When the subprime-mortgage crisis hit, it was widely predicted that the dollar would suffer. In fact, the greenback strengthened as investors seeking a safe haven rushed into US Treasury bonds. A year later, when Lehman Brothers failed, the dollar benefited from the safe-haven effect yet again. Data from the International Monetary Fund confirm that these shocks caused little (if any) decline in the dominance of the dollar in central banks’ holdings of foreign-currency reserves. Likewise, data gathered by the Bank for International Settlements show that the dollar dominates global foreign-exchange transactions as much as it did in 2007. But a default on US government debt precipitated by failure to raise the debt ceiling would be a very different kind of shock, with very different effects. In response to the subprime disruption and Lehman’s collapse, investors piled into US government bonds, because they offered safety and liquidity – prized attributes in a crisis. These are precisely the attributes that would be jeopardized by a default. The presumption that US Treasury bonds are a safe source of income would be the first casualty of default. Even if the Treasury paid bondholders first – choosing to stiff, say, contractors or Social Security recipients – the idea that the US government always pays its bills would no longer be taken for granted. Holders of US Treasury bonds would begin to think twice. The impact on market liquidity would also be severe. Fedwire, the electronic network operated by the US Federal Reserve to transfer funds between financial institutions, is not set up to settle transactions in defaulted securities. So Fedwire would immediately freeze. The repo market, in which loans are provided against Treasury bonds, would also seize up. For their part, mutual funds that are prohibited by covenant from holding defaulted securities would have to dump their Treasuries in a self-destructive fire sale. Money-market mutual funds, virtually without exception, would “break the buck,” allowing their shares to go to a discount. The impact would be many times more severe than when one money-market player, the Reserve Primary Fund, broke the buck in 2008. Indeed, the entire commercial banking sector, which owns nearly $2 trillion in government-backed securities – would be threatened. Confidence in the banks rests on confidence in the Federal Deposit Insurance Corporation, which insures deposits. But it is not inconceivable that the FDIC would go bust if the value of the banks’ Treasury bonds cratered. The result would be a sharp drop in the dollar and catastrophic losses for US financial institutions. Beyond the immediate financial costs, the dollar’s global safe-haven status would be lost. It is difficult to estimate the cost to the US of losing the dollar’s position as the leading international currency. But 2% of GDP, or one year’s worth of economic growth, is not an unreasonable guess. With foreign central banks and international investors shunning dollars, the US Treasury would have to pay more to borrow, even if the debt ceiling was eventually raised. The US would also lose the insurance value of a currency that automatically strengthens when something goes wrong (whether at home or abroad). The impact on the rest of the world would be even more calamitous. Foreign investors, too, would suffer severe losses on their holdings of US treasuries. In addition, disaffected holders of dollars would rush into other currencies, like the euro, which would appreciate sharply as a result. A significantly stronger euro is, of course, the last thing a moribund Europe needs. Consider the adverse impact on Spain, an ailing economy that is struggling to increase its exports. Likewise, small economies’ currencies – for example, the Canadian dollar and the Norwegian krone – would shoot through the roof. Even emerging-market countries like South Korea and Mexico would experience similar effects, jeopardizing their export sectors. They would have no choice but to apply strict capital controls to limit foreign purchases of their securities. It is not inconceivable that advanced countries would do the same, which would mean the end of financial globalization. Indeed, it could spell the end of all economic globalization. Sane governments do not default when they have a choice – especially not when they enjoy the “exorbitant privilege” of issuing the only true global currency. We are about to find out whether the US still has a sane government. We now know where we stand. Janet Yellen is to take over the US Federal Reserve, the world's monetary hegemon, the master of all our lives. She has pedigree. Her husband is Nobel laureate George Akerlof, the scourge of efficient markets theory. She co-authored "Market for Lemons", the paper that won the prize. She was on the other side a decade later during those crucial months before the subprime housing crash, quick to sense the danger of a chain reaction through the shadow banking system. Ben Bernanke and the FOMC majority scoffed at worries that the subprime debacle was the tip of an iceberg. “I feel the presence of a 600-pound gorilla in the room, and that is the housing sector. The risk for further significant deterioration, with house prices falling and mortgage delinquencies rising, causes me appreciable angst," she told Fed colleagues in June 2007, a 15 months before the storm hit. The transcripts show that she clashed with New York Fed chief William Dudley in December 2007 over the risks of subprime mortgage defaults, which is telling since Dudley (ex Goldman Sachs) was supposed to be the official with his finger on the market pulse. “The possibilities of a credit crunch developing and of the economy slipping into a recession seem all too real. At the time of our last meeting, I held out hope that the financial turmoil would gradually ebb and the economy might escape without serious damage. Subsequent developments have severely shaken that belief,” she said. She was absolutely right again. We now know that the US economy was already in recession by then (though the Fed did not then have the data). We now know too from a devastating book by the Richmond Fed’s Robert Hetzel – "The Great Recession" – that the Fed itself was the chief cause of the disaster that unfolded in 2008. The FOMC was far too tight. It let the M2 money supply implode in early 2008. That is what led to the Lehman, AIG, Fannie/Freddie disasters. The rest is noise. Janet Yellen was not to blame. She later backed QE to the hilt, fighting a chorus of amateur alarmists who claimed that inflation was poised to take off. She was again proved right. Core inflation in the US is currently hovering near a half century low. The greater danger is still deflation. There is little doubt that the she is a dove in today's circumstances. She tracks jobs. Her lodestar is the “non-accelerating inflation rate of unemployment" (NAIRU). When the rate is above NAIRU, she is a dove: when below, she is a hawk. My guess is that we are still a very, very long way for NAIRU. Yes, the Fed is committed to tapering QE to zero once the jobless level reaches 7pc (and raise rates once it hits to 6.5pc), and yes, this could in theory happen much sooner than the think want since the headline rate has already plummeted to 7.3pc. But this headline rate is wildly misleading because so many workers have given up searching for a job. They have fallen off the rolls. The labour participation rate has collapsed to a 35-year low of 63.2pc. It is blindingly obvious that the real rate of unemployment is much higher than it looks. Some of these people have been driven out of the work force for ever, left behind by new technologies, but surely not all. Mrs Yellen tipped her hand in a speech to the labour unions in February, a text now being studied for clues. Three million Americans have been looking for work for one year or more; that's one-fourth of all unemployed workers, which is down from 2011's peak but far larger than was seen before the Great Recession. These are not just statistics to me. We know that long-term unemployment is devastating to workers and their families. When you're unemployed for six months or a year, it is hard to qualify for a lease, so even the option of relocating to find a job is often off the table. The toll is simply terrible on the mental and physical health of workers, on their marriages, and on their children. If the current, elevated rate of unemployment is largely cyclical, then the straightforward solution is to take action to raise aggregate demand. If unemployment is instead substantially structural, some worry that attempts to raise aggregate demand will have little effect on unemployment and serve only to stoke inflation. I see the evidence as consistent with the view that the increase in unemployment since the onset of the Great Recession has been largely cyclical and not structural. So there we have it. The next chairman of the Fed is going to track the labour participation rate. Money will stay loose. Markets have been spared again. The Brics can breathe easier. This leaves me deeply uneasy. We are surely past the point where we can keep using QE to pump up asset prices. My view is that emergency stimulus should henceforth be deployed only to inject money directly into the veins of the economy as an adjunct to the US Treasury, by fiscal dominance, as deemed necessary. That would take an intellectual revolution. Is Janet Yellen game for such incendiary ideas? Which Side Of Goldman Sachs Is Right About Gold? Now, some of our clients are speculating that the price of gold will rise in the future. And we have other clients who are speculating that the price of gold will fall. They place their orders with us, and we buy or sell their gold for them...The good part, William, is that, no matter whether our clients make money or lose money, Duke & Duke get the commissions. Randolph Duke, from the movie "Trading Places." The head of Goldman Sachs's commodity research, Jeffrey Currie, reiterated his "sell" recommendation on gold today with a price target of $1050. Interestingly, and in direct conflict with Currie's market call on gold, Goldman Sachs Group (GS) filed an SEC 13-F disclosure at the end of June, which revealed that GS purchased over 3.7 million shares of the SPDR Gold Trust (GLD) during the 2nd quarter, making GS the 6th largest holder of GLD. 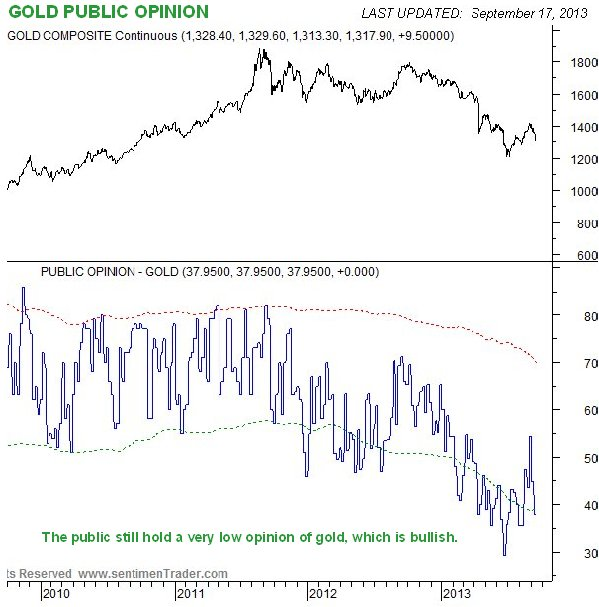 Clearly there is a difference of opinion within the firm regarding the outlook for the price of gold. As an investor should you follow the guy selling research or do you follow the money? Currie issued a "sell on gold originally on September 13th, citing the Fed's "taper" and an improving economy as his reasoning. Five days later the Fed deferred on tapering and gold is now 2% above where it was ($1296) just before the September 18th FOMC policy statement. For reference, the S&P 500 is 1.5% below where it was right before the FOMC policy release. As for the economy, I have published two recent articles documenting, with hard data and analysis, fundamental evidence that the economy - contrary to Currie's view - is actually starting to slow down quickly. The first one covers decelerating auto sales in August, which was further confirmed with September's auto sales data. The second articledocuments several economic data reports showing the economic slowdown that is occurring. I also suggest that the Fed will likely defer any taper indefinitely and it might in fact be forced to increase QE. In other words, Currie's original two premises for issuing a "sell" on gold are not valid. Today Currie reiterated his "sell" on gold, with the explanation that, once the budget and debt ceiling "stalemate" is over, "significant [economic] recovery in the U.S. and tapering of QE should put downward pressure on gold prices." While I agree that gold might get sold off briefly once the budget/debt ceiling impasse is resolved, I have not seen any recent evidence pointing to any kind of economic strength or any signs of recovery. Furthermore, with a much higher debt ceiling and increased Treasury debt issuance that will be required in order to fund a higher level of Government spending, it is far likelier that the Fed will be forced to increase its Treasury debt purchases rather than taper at all. Notwithstanding whether or not you might agree with my view on the economic outlook or the prospects for more QE, it turns out that while Jeffrey Currie is out issuing his "slam dunk" sell recommendation on gold, the money trail shows that Goldman Sachs Group increased its holdings in GLD from about 650,000 shares to over 4.4 million shares during the 2nd quarter this year (link above), making GS the 6th largest holder of the gold trust. What intrigues me about this is that, without knowing or trying to second-guess Currie's motives for his bearish call on gold, Goldman's actions speak much louder than Currie's words. Just like it's always helpful to know that insiders are buying a company's stock when you decide to invest, for me it's helpful to add to my gold positions when I know that a big Wall Street firm is committing real money to the same side of the trade. For point of reference, the World Gold Council has historically underestimated Indian gold demand annually. If in fact, India's demand for gold bounces back to at least 300 tonnes during the 4th quarter this year, it will put a lot of upward price pressure on a physical market that is already stressed with supply shortages from China's voracious demand. In fact, it was reported yesterday that Indian gold importers have started processing orders ahead of the festival and wedding season. (Please note that the gold imported into China through Hong Kong does not include any gold that may or may not have been purchased by the Peoples Bank of China - China's Central Bank - as any gold imported by the Government is not reported). 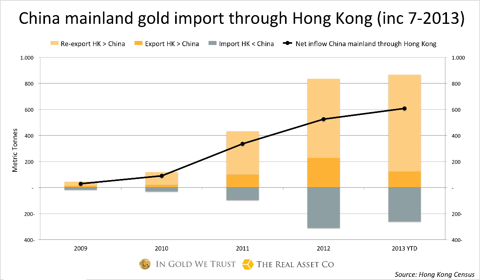 If you assume China continues to import gold at the same rate for rest of 2013, it will have imported over 1300 tonnes. Adding this to the estimate for India would mean that China and India combined will have imported more gold (2300 tonnes) in 2013 than is estimated will be produced by all gold mines globally (2200 tonnes). In other words, demand from China and India alone in 2013 has and will continue to exert a lot of pressure on the supply of physical gold. And this doesn't take into account all the other eastern hemisphere/BRIC countries in which the Central Banks are accumulating gold. At the very least, demand of physical gold from just India and China will put a floor under the current price of gold, making Currie's forecast of $1050 - in my view - highly improbable. But I also strongly believe that over the next few months - away from any geopolitical and economic factors - the demand for gold from the countries that are big buyers will exert upward pressure on the price. This chart is reinforced by Marketvane's Bullish Consensus for gold, which is a very low 41% and the Hulbert Gold Newsletter Sentiment Index, which is negative 20, indicating that investment newsletters are recommending a net short position in gold and mining stocks. In other words, based on public opinion and investor sentiment levels, anyone who wanted to sell their gold positions has probably already done so, which means that it is likely the next move in gold is up. The trend in the 1-month rolling correlation with the dollar has now reversed: the level is back in the middle of the range at -0.54. This suggests that gold is currently better positioned to benefit from any dollar weakness ahead than it was over a month ago. (UBS-London Precious Metals Daily). In other words, we can expect that gold will tend to move higher on days when there is dollar weakness. If I'm right about the Fed eventually increasing QE to accommodate a higher level of Treasury debt issuance in order to keep interest rates contained, the dollar is going to take a beating and gold will, conversely, experience a dramatic move higher. This scenario could well play out within the next 4-8 weeks. While Jeffrey Currie's flashy "slam dunk" sell recommendation on gold makes for attention-grabbing headlines, it lacks support from any kind of substantive fundamental analysis. Not only that, it stands in direct conflict with the fact that Goldman Sachs has assumed a large long position in GLD. 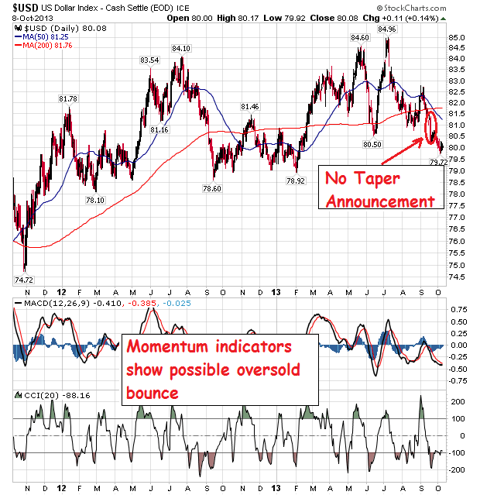 Contrary to Currie, I have laid out my view for why I think gold is poised for a potentially big move higher and I have at least laid out several fundamental factors that could trigger this move. If you agree with my view, I first and foremost recommend accumulating physical gold in the form of 1 oz. sovereign-minted bullion coins (gold eagles, maple leafs, philharmonics, etc) that you safe keep yourself. If you want to also try to generate trading profits, the least risky way to index the price of gold is to buy GLD. More speculative vehicles include the PowerShares DB Gold Double Long ETN (DGP), which is 2x gold, or the VelocityShares 3X Long Gold ETN (UGLD). As I mentioned above, gold could briefly sell-off when the budget/debt ceiling impasse is resolved, but I would use that as opportunity to buy into the speculative trading plays.